I came to this country expecting to see mindsets of destruction and disaster. Nevertheless, I wouldn’t think it would be a secret itself. The country keeps its own secrets from its people. When the Khmer Rouge decided to kill roughly 2 million people, the king was nowhere to be found. He and his family were protected from the path of destruction created by the Khmer Rouge at this time. From my understanding a king is supposed to not only protect his country, but his people as well. Yet he chose to to protect himself. I bet most of the people in Cambodia didn’t know that because during the current time, the history about the Khmer Rouge is forbidden to be taught in school. 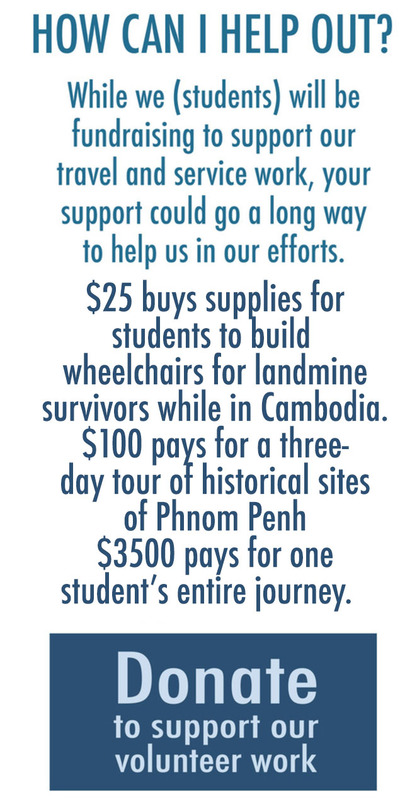 Why should a native have to pay more than a tourist at Tuol Sleng or pay at all in general just to learn about the history of the country in which they live? I’m from the USA and I know not just just about my county but about many other countries as well. I’m taught most of this in school, but I seen it’s very different in this country. Cambodia is like Pandora’s box; there are so many happy spirits. I asked myself how, but I realized that these people genuinely have beautiful hearts. Their country is amazing despite all the terrors of the past. The art within a man is the beauty within a story. One of the 7 survivors from the devastating genocide was happy to know people still love and care. The king lives in royal decadence. These victims weren’t saved, but their bones were and their spirits still live. The hope of Orphans keeps them moving and keeps visitors coming. Thank you for the interesting and heartfelt post, Tamara. I agree with you that only by being aware of history can we prevent the mistakes and atrocities of the past. If it were my country, I would prefer to know. I’m happy that you met folks with kind and gentle hearts, during your adventure!